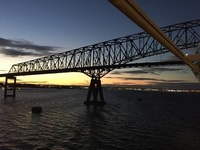 You can see photos from this cruise and our other sailings by following the link on our Cruise Critic profile page: https://boards.cruisecritic.com/profile/35108-jgnova/ My employer closes for the holidays every winter, providing a great opportunity to take a longer-than-usual cruise spanning both holidays plus a few days on both ends. The holiday sailing on Grandeur of the Seas met our needs as it aligned perfectly with my break at work and we like the Baltimore port’s proximity to our house. We pulled out of our driveway at 11:45 and were in our cabin by 1:30. This was our fifth time and our second holiday sailing on the Grandeur, the first being last year on a slightly different itinerary. This year we went to St. Croix (last year was St. Thomas), Antigua, St. Lucia (Martinique last year), St. Kitts, and Sint Maarten. As in previous experiences with the Baltimore port, everything went very smoothly – only a few cars ahead of us to check our bags, no line inside the terminal for the metal detector or to check in. And right up the back-and-forth gangplank and onto the ship. There was the usual boarding day elevator delay as some elevators were being used for luggage transport. We got to our cabin, took the standard photos of our cabin to post on the web, and went off to Park Café for our traditional embarkation-day roast beef sandwich lunch and our first food disappointment of the cruise – they had turkey instead of roast beef!!!!! We were told they alternated among turkey, roast beef, and pork, but we found roast beef only once so we must have forgotten to check every day. 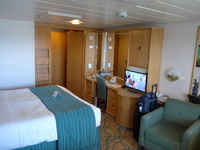 Cabin: We were in cabin 8548, a mid-ship Junior Suite on the starboard side. This cabin (and its port-side equivalent, 8048) has the advantage of being opposite a right-angle passage from the mid-ship staircase lobby, avoiding corridor traffic and lobby noise. Like all cabins on Grandeur, it feels dated with its blond wood and green upholstered furniture (which actually is quite comfortable). The Junior Suite has more storage than most other cabin classes, with three drawers in the triple door closet, six drawers in the desk area, plus a few more drawers and cabinets opposite the closet. There are also two chairs and a convertible sofa with a coffee table and two ottomans (with removable tops for more storage). The bathroom had a bathtub, harder to get in and out of than a walk-in shower, but with the trade-off of more space for showering. We also had a balcony with two chairs and a table. This is a very comfortable cabin for the two of us and has plenty of space for company to come visit. Food: We ate most dinners in the Great Gatsby main dining room or Windjammer, my go-to spot for breakfast as well. (The continental breakfast options on the free room service menu are limited but sufficient. Delivery was often before or after the half hour selected; a few times they called before delivery. We didn’t get any coffee or tea since the Junior Suite has coffee/tea service in the cabin.) The dining room food was good, but the selection options were a major disappointment from previous sailings on Grandeur. The MDR dinner menus no longer offered a daily chilled soup and the only salad offering was Caesar Salad – EVERY NIGHT! (There were a very few other salads offered during a few of the 12 nights but generally, they were specialty salads and there was no garden greens salad option.) Last year, the “every night starters” consisted of Caesar Salad, Escargot, Shrimp Cocktail, and French Onion Soup. This year, they added a Seasonal Fruit Medley every night as well. But the trade-off was the loss of a different salad and chilled soup each night, and a reduction in the other appetizer selections from three to two. The main course options were reduced as well. Last year we had five “every night” options, reduced this year to three, and the varying options were reduced as well. Desserts also had only two or three changing items each night plus the standard chocolate cake, apple pie, cheesecake, ice cream (always vanilla, chocolate, and strawberry), and crème brûlée. The appetizer fruit plate served as a nice dessert if nothing on the dessert menu was interesting. We found the menus so boring that we occasionally ate dinner in Windjammer just to get some variety. Service was slow the first night but improved when the maître ď suggested that all the waiters serve the smaller (two-person) tables before the larger groups. We ate dinner in the Windjammer three times because of the international offerings those nights – one was Indian and another South American. The Indian food was excellent and varied, the South American not so much. Windjammer at night is a nice place to eat as it is usually quieter and the large windows all around provide nice views of passing ships. And there often are sightings of officers and their families in Windjammer. Ship overall: Grandeur is a lovely ship with artwork in all of the stateroom corridors and in all of the stairway landings. The ship is very bright and open feeling with lots of glass in almost every venue. I could usually find a chaise in a quiet shady spot on deck, my preferred spot on a cruise. The Solarium indoor pool area was crowded most days, but seemed to empty out around 4 PM every day, when I would go for a swim in the indoor pool. Entertainment: We tend to skip most ship entertainment because the volume level hurts our ears. Some of the music sounded like something we might enjoy but not enough to justify the hearing damage. Ports: St. Croix: We have been to St. Croix several times and in the past have gone to Sandcastle on the Beach resort for some beach time. We decided to try Rainbow Beach this year. The beach seemed larger than Sandcastle, but had many more people. We did not try the food in the restaurant. We will return to Sandcastle on our next visit to St. Croix. Antigua: We went with a group to BeachLimerZ on Fort James Beach, a ten-minute taxi ride from the port. The beach was very nice and the food and service were excellent. We might go there again – or try another of Antigua’s 365 beaches. St. Lucia: We took the water taxi across the bay to town and went to the Cathedral and Derek Walcott Square, attractions we enjoyed on previous visits. (Restoration of the Cathedral continues, though there is still quite a way to go.) St. Kitts: We had nothing planned for St. Kitts, as we have been there several times and toured the entire island. This turned to be an accidentally wise choice as it rained on and off almost all day. Sint Maarten: We took a ship excursion to the beach at The American Greenhouse on Simpson Bay. This was a lovely beach with water sports and a nice restaurant with good food. Overall experience: We lucked out with great weather for most of the cruise, with the only rainy day being on the port day at St. Kitts. The seas were calm for the entire trip, making things even better. As always, the staff and crew on Grandeur were friendly and provided great service. The only complaints we had were about the dinner menu selections, addressed above, and that RCI has decided not to offer the 12-night itinerary for at least the next two holiday seasons. But we’ll be back for another cruise at a different time of the year. 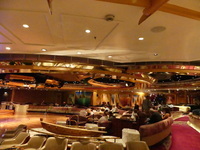 South Pacific Lounge - used for bingo, art auctions, and dancing. My employer closes for the holidays every winter, providing a great opportunity to take a longer-than-usual cruise spanning both holidays plus a few days on both ends. The holiday sailing on Grandeur of the Seas met our needs as it aligned perfectly with my break at work and we like the Baltimore port’s proximity to our house. We pulled out of our driveway at 11:45 and were in our cabin by 1:30. This was our fifth time and our second holiday sailing on the Grandeur, the first being last year on a slightly different itinerary. This year we went to St. Croix (last year was St. Thomas), Antigua, St. Lucia (Martinique last year), St. Kitts, and Sint Maarten. As in previous experiences with the Baltimore port, everything went very smoothly – only a few cars ahead of us to check our bags, no line inside the terminal for the metal detector or to check in. And right up the back-and-forth gangplank and onto the ship. There was the usual boarding day elevator delay as some elevators were being used for luggage transport. We got to our cabin, took the standard photos of our cabin to post on the web, and went off to Park Café for our traditional embarkation-day roast beef sandwich lunch and our first food disappointment of the cruise – they had turkey instead of roast beef!!!!! We were told they alternated among turkey, roast beef, and pork, but we found roast beef only once so we must have forgotten to check every day. We were in cabin 8548, a mid-ship Junior Suite on the starboard side. This cabin (and its port-side equivalent, 8048) has the advantage of being opposite a right-angle passage from the mid-ship staircase lobby, avoiding corridor traffic and lobby noise. Like all cabins on Grandeur, it feels dated with its blond wood and green upholstered furniture (which actually is quite comfortable). The Junior Suite has more storage than most other cabin classes, with three drawers in the triple door closet, six drawers in the desk area, plus a few more drawers and cabinets opposite the closet. There are also two chairs and a convertible sofa with a coffee table and two ottomans (with removable tops for more storage). The bathroom had a bathtub, harder to get in and out of than a walk-in shower, but with the trade-off of more space for showering. We also had a balcony with two chairs and a table. This is a very comfortable cabin for the two of us and has plenty of space for company to come visit. Last year, the “every night starters” consisted of Caesar Salad, Escargot, Shrimp Cocktail, and French Onion Soup. This year, they added a Seasonal Fruit Medley every night as well. But the trade-off was the loss of a different salad and chilled soup each night, and a reduction in the other appetizer selections from three to two. The main course options were reduced as well. Last year we had five “every night” options, reduced this year to three, and the varying options were reduced as well. Desserts also had only two or three changing items each night plus the standard chocolate cake, apple pie, cheesecake, ice cream (always vanilla, chocolate, and strawberry), and crème brûlée. The appetizer fruit plate served as a nice dessert if nothing on the dessert menu was interesting. We found the menus so boring that we occasionally ate dinner in Windjammer just to get some variety. Service was slow the first night but improved when the maître ď suggested that all the waiters serve the smaller (two-person) tables before the larger groups. We ate dinner in the Windjammer three times because of the international offerings those nights – one was Indian and another South American. The Indian food was excellent and varied, the South American not so much. Windjammer at night is a nice place to eat as it is usually quieter and the large windows all around provide nice views of passing ships. And there often are sightings of officers and their families in Windjammer. 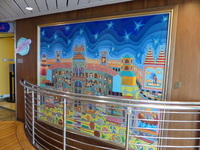 Grandeur is a lovely ship with artwork in all of the stateroom corridors and in all of the stairway landings. The ship is very bright and open feeling with lots of glass in almost every venue. I could usually find a chaise in a quiet shady spot on deck, my preferred spot on a cruise. The Solarium indoor pool area was crowded most days, but seemed to empty out around 4 PM every day, when I would go for a swim in the indoor pool. We tend to skip most ship entertainment because the volume level hurts our ears. Some of the music sounded like something we might enjoy but not enough to justify the hearing damage. St. Croix: We have been to St. Croix several times and in the past have gone to Sandcastle on the Beach resort for some beach time. We decided to try Rainbow Beach this year. The beach seemed larger than Sandcastle, but had many more people. We did not try the food in the restaurant. We will return to Sandcastle on our next visit to St. Croix. 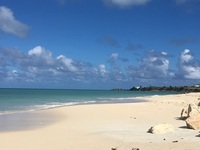 Antigua: We went with a group to BeachLimerZ on Fort James Beach, a ten-minute taxi ride from the port. The beach was very nice and the food and service were excellent. We might go there again – or try another of Antigua’s 365 beaches. St. Kitts: We had nothing planned for St. Kitts, as we have been there several times and toured the entire island. This turned to be an accidentally wise choice as it rained on and off almost all day. Sint Maarten: We took a ship excursion to the beach at The American Greenhouse on Simpson Bay. This was a lovely beach with water sports and a nice restaurant with good food. Overall experience: We lucked out with great weather for most of the cruise, with the only rainy day being on the port day at St. Kitts. The seas were calm for the entire trip, making things even better. As always, the staff and crew on Grandeur were friendly and provided great service. The only complaints we had were about the dinner menu selections, addressed above, and that RCI has decided not to offer the 12-night itinerary for at least the next two holiday seasons. But we’ll be back for another cruise at a different time of the year. Cabin 8548 is roughly mid-ship on the starboard side. The Junior Suite cabins are about three feet wider than standard balcony cabins, allowing space for both a sofa and two upholstered chairs in the cabin - and for a bathtub instead of a stall shower. The extra width also included more storage in the entryway and a wider balcony. Cabin 8548 (and its port-side equivalent 8048) are in an interesting location directly opposite an almost secret passage from the mid-ship stairway lobby, providing faster access to the stairs while not carrying the music from the Centrum. This cabin is also one that does not have a pole at the foot of the bed, found in some JS cabins. We took a taxi to BeachLimerZ on Fort James Beach, a ten-minute ride from the pier. Lovely beach, good food, chair and umbrella rentals. Very friendly staff. Great port for embarkation and disembarkation. Friendly staff and porters - easy to access (right off I95) and for parking. We took the water taxi from the pier to town and visited the lovely Cathedral and Derek Walcott Square. Then sat on deck and watched the airplanes taking off at the airport. Went to Kim Sha Beach at Simpson Bay. Had use of facilities at The American Greenhouse and enjoyed included lunch and rum punch.